You can purchase the 34-page unit PLUS a Jeopardy-type game for the easy mystery, The Buddy Files: The Case of the Lost Boy for immediate download for only $16.95! Here I am in the P-O-U-N-D. How did I get in the P-O-U-N-D, you ask? It's kind of a long story. First Mom disappeared, but Kayla said not to worry. She went to something called the National Guard. Then, Kayla and her dad took me to my vacation place at Barker Bob's. I got to swim and run and play with the other dogs. I wasn't worried at all until they never came back to get me. Then I got worried. I ended up in the P-O-U-N-D (we are not allowed to say it out loud). Where was Kayla? How would she know where I was? I really wasn't too worried because Kayla and I have solved lots of mysteries together. I knew the steps! There was the first step... and the second step... The third step was to make a plan...and # 1 on that list was to escape from the pound! I was still working on figuring that out when a sad boy named Connor and his mother came into the P-O-U-N-D. Mom said she wanted to adopt me, but I knew that families can't adopt dogs. Dogs adopt families! But they did it anyway! You won't believe where they took me! You won't believe what happened to Connor! You won't believe the mistake I made! You won't believe what I had to do to solve this case! Luckily, I put it all in my detective book I called The Case of the Missing Boy. You should read it. (It's got pizza in it. I love pizza. It's my favorite food.) It's got big type and even some pictures that my friend, Jeremy Tugeau drew. But don't let the big type and pictures fool you. This is a top-notch mystery! 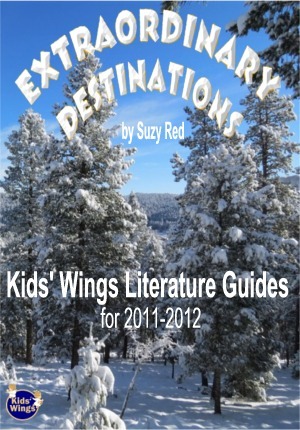 The Kids' Wings literature guide invites group discussion, problem solving, deciphering clues, editing a letter, skill building, and authentic writing prompts and a culminating interactive Jeopardy-type game. Teachers who want students to enjoy the fun of an easy mystery written in first person in Buddy's voice and present tense (a great writing model), will find this first of the series a MUST-have for their class library and the Kids Wings unit essential to interactive fun and skill-building! by Dori Hillestad Butler is now available! The Buddy Files: The Case of the Lost Boy is one of the 26 literature guides for award-winning literature in our Extraordinary Destinations Collection. Though you can order each unit individually for about $16.95, if you order Extraordinary Destinations you will get the 26 units for less than $1.00 each in a spiral-bound book with CD in its back pocket! Order while supplies last! Buy The Buddy Files: The Case of the Lost Boy by NOW! YYour purchases through the Kids Wings and Amazon Links help to keep our website doors open!